producers, grazers, nitrogen fixers and predators) (Box 14.2); macroplankton (20-200 mm) (larvaceans, larval fishes and other zooplankton that are grazers and predators) and megaplankton (over 200 mm) (jellyfish, salps and other zooplankton that are mainly grazer and predators). Our primary focus here is organisms between 2 ^m and 20 ^m in size: the nanoplankton. Members of the nano-plankton are very small and characterised by a high surface area to volume ratio. The surface area to volume ratio influences the amounts of materials exchanged with the environment. In general, an inverse relationship between size and reproductive capacity is observed (i.e. small cells have a much higher reproductive rate than large cells), although this relationship is not easily applied to flagellated forms of the different size classes and some diatoms can outgrow picoplankton (e.g. Prochlorococcus). The high reproductive capacity is linked to the ability to immediately respond to short nutrient pulses. Therefore, nanoplankton often occurs at high biomass per unit volume. For example, high biomass patches can stretch over kilometres and the resultant chlorophyll fluorescence is readily visible from space via satellites. These population/community maxima may, however, be short-lived and can change dramatically within the space of a day or two. Grazing is another factor that controls the biomass of these very small organisms, as they are readily consumed by grazers such as protozoa, pelagic tunicates, rotifers and crustaceans. 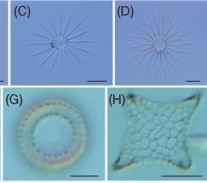 Figure 14.7 A, dead floating Trichodesmium cells in a convergence (photo: M. Kingsford); B, detail of Trichodesmium 'puff' (photo: K. Heimann). Trichodesmium is a filamentous blue green alga that is often abundant in the water column and aggregated at the surface of tropical waters. Trichodesmium will form visible blooms under ideal environmental conditions (calm) and colonies (tuft colonies generated by the parallel alignment of filaments or puff colonies due to radial alignment are 0.5-3 mm in diameter, so often visible to the naked eye). Great drifts, usually of dead cells, are common on the surface of the ocean; this phenomenon has been termed 'sea sawdust' by sailors (Fig. 14.7). Concentrations of dead cells are often in the convergence zones of tidal fronts, windrows and internal waves. Although the cells within a filament are tiny, Trichodesmium is critical for the fixation of atmospheric nitrogen in oligotrophic tropical marine environments. 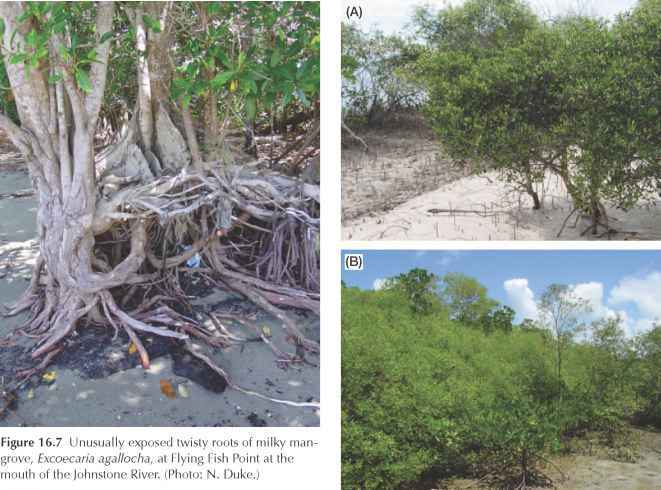 Nitrogen fixation in tropical waters often exceeds 30 mg m2 day1, contributing significantly to the availability of nitrogen based molecules in these nutrient-poor waters. Trichodesmium thrives in areas with low dissolved inorganic nitrogen levels as it out competes organisms that cannot fix atmospheric nitrogen. The abundance of Trichodesmium in these areas of the ocean is limited by the availability of trace elements, such as iron, molybdenium, and vanadium, essential elements of the nitrogen-fixing machinery. organisms swim very fast, changing directions frequently diving in and out of the focal plain of the high resolution objectives. 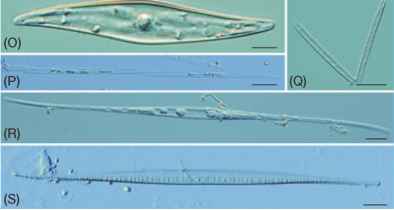 In most instances, verification by optical and electron microscopy (scanning electron microscopy for surface structures and flagellation and transmission electron microscopy for chloroplast and flagellar apparatus characteristics) is required to assign these organisms to a particular phylum/class. Another problem in analysing the species composition and abundance of nanoplankton is that unambiguous identification requires knowledge about the 'colour' of these organisms (i.e. pigments—the presence and combinations of the various chlorophylls). Typically the colour of individual cells is not readily observed due to their small size, adding to the problem of positively identifying members of the nanoplankton assemblage. Given the above impediments, it is not surprising that much less is known about the species composition and dynamics of these nanoplankton. Much of these taxonomic uncertainties can be overcome by culturing efforts, which aim to establish monoclonal cultures. These cultures can be used for pigment analyses and morphological examinations and will be the foundation for genetic probe developments, which can be employed in the field for direct qualitative (taxonomic) and quantitative (enumeration) community analysis of the nanocosm of the ocean environment. whether they are harmful or harmless. In any case, these blooms are spectacular at night, as Noctiluca scintillans is a bioluminescent dinoflagellate (capable of producing and emitting its own light), and causes 'phosphorescence of the sea'. In contrast, many diatoms (i.e. Pseudo-nitzschia multiseries) and dinoflagel-lates (i.e. Karenia breve in Florida) produce potent toxins and their blooms result in large fish and marine mammal mortality. Human health can be adversely affected by consuming contaminated shellfish (shellfish filter algae and accumulate toxins in their body tissues) or via inhalation of organisms contained in ocean spray. These blooms develop when environmental conditions are perfect, that is, warm surface temperatures, stagnant and stratified water masses, low turbulence, and high light intensities are critical factors in bloom establishment and duration. An example of a bloom considered of fundamental importance in nitrogen cycling in tropical waters is produced by the cyanobac-terium Trichodesmium. It fixes large amounts of atmospheric nitrogen and thus contributes significantly to the availability of nitrogen in these otherwise oligo-trophic waters (see below). An amazing variety of dinoflagellates, centric and pennate diatoms exist within the central GBR region in this size class of phytoplankton (Fig. 14.9). Compared to the nanoplankton, their surface to volume ratio is reduced due to their larger size and their rates of cell division are slower. Also, their nutritional strategies differ from those of nanoplankton in that these organisms can exploit nutrient patches by storing these nutrients inside their cells (e.g. phosphates). Thus, the presence and abundance of microplankton may be 'decoupled' from nutrient availability. Unlike the much smaller nanoplankton, sinking out of the photic zone is possible for larger phytoplankton. There are many means that phyto-plankton use to avoid sinking. Buoyancy may be increased by the presence of gas vesicles or the storage of light oils, surface area increased by the production of elaborate cell surface extensions as observed in the centric diatoms Bacteriastrum and Chaetoceros, and mobility increased by powerful flagellation in the dinoflagellates. Susceptibility to grazing is size-dependent, with grazing pressure inversely related to cell size. The evolution of spines (setae) and the ability to form buoyant mats (Rhizosolenia) is a valuable anti-sinking strategy and may deter some herbivores. 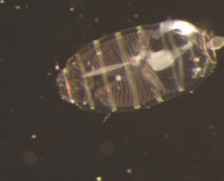 Net plankton are often the focus of studies because they represent a critical link between microbes and larger organisms such as fish. These organisms include a broad range of zooplankton including nauplii and juveniles (e.g. copepodites) as well as adult holoplankton and many larval forms. 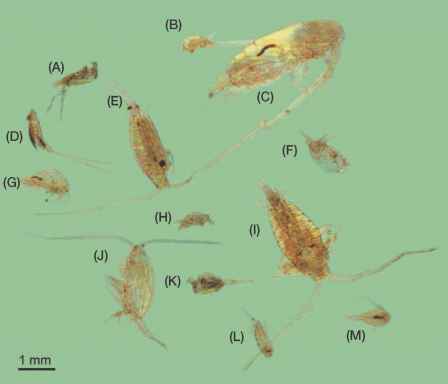 Copepods (Subclass Copepoda) often dominate zooplankton samples (up to 80% of catches and 193 species on the GBR) and common genera in waters of the GBR include: small sized Parvocala-nus and Bestiolina; medium-sized Acartia, Paracalanus, and Temora (~ 0.7 mm to 1.1 mm adults), and larger (~ 1.0 mm to 3.0 mm) Candacia, Undinula, Eucalanus, Cen-tropages, Labidocera, and Pontella of the Order Calanoida; small to medium-sized Oithona and Oncaea (~ 0.7 mm to 1.1 mm adults), of the Orders Cyclopoida; and Euterpina and Microsetella of the Order Harpacticoida (Fig. 14.10). Other important members of the Phylum Crustacea that are found in net plankton include Penilia (Order Ctenopoda). Common elongate plankton include Oikopleura, Fritillaria (larvaceans or appendicularians; eight species on GBR) and small arrow worms (Phylum Chaetog-natha, 12 species on GBR). Larvaceans feed on pico-plankton, while chaetognaths are voracious predators on meso- and megaplankton. The abundance of larval forms varies with the timing of spawning of different taxa, but common crustacean larvae include barnacle nauplii (usually too small for mesoplankton nets) and cyprids as well as crab zoea, prawns (e.g. Acetes), stomatopod larvae (Squilla) and Lucifer. Fish larvae can be very abundant especially after the mass release of larvae from demersal eggs around new and full moons. Coral spawn can be abundant in nets at times of mass spawnings, causing plankton nets to go pink. Other common larvae include polychaete worms and gastropod larvae. Although the cells of Trichodesmium are tiny masses of cells they can clog mesoplankton nets. (I).- : .■ • -. ■.-...-. Some copepods (Pontella), euphausiids (14 species on GBR) and many elongate zooplankters such as larvaceans/appendicularians (e.g. Megalocercus), cha-etognaths and fish larvae are over 1 mm long (Fig. 14.11). Molluscs that include cone-shaped ptero-pods (15 species on GBR) and gelatinous heteropods (three species on GBR) are common. Large zooplankton are in the 'grey' zone of what is defined as 'plankton' in that many have great mobility and could almost be considered free swimming nekton. The early life history stages of fish, for example, hatch at small sizes (2 mm to 6 mm), but many settle on reefs at large sizes (e.g. 1-4 cm) and have excellent swimming and sensory abilities (i.e. olfaction, hearing and vision) that assist orientation. Phylum Cnidaria includes the Class Scyphozoa, represented by many large jellyfish, some of which have tentacles that extend over 3 m in length (e.g. Cyanea, Desmonema, 'Lions mane' jellyfish) and they can weigh over 10 kg. Others have stumpy tentacles, such as Catostylus, and some of these taxa are targeted by fisheries for sushi grade jellyfish (adults are up to 5 kg wet weight). Jellyfishes are close relatives of corals and some taxa (e.g. Phyllorhiza punctata) have symbiotic algae (i.e. zooxanthellae). One of the most common j ellyfish in coastal waters is Aurelia (moon jelly) that is harmless and like most jellyfish can be found in great numbers. Densities of jellyfish can be so great at times that they are referred to as 'blooms'. The deadliest jellyfish belong to the Class Cubozoa and include stingers and multiple types of j ellyfish that are responsible for the medical condition called Irukandji syndrome (e.g. Carukia barnesi and Pseudoirukandji spp., see Chapter 18). Conspicuous neustonic taxa are often species of the Class Hydrozoa. The Portuguese man-of-war or blue-bottle (Physalia sp. ), smaller taxa that include the by-the-wind sailor (Velella vellella) and Porpita sp. float and are common as drift on beaches and are well known for their painful stings. Siphonophores (Class Siphonophora; 32 species on GBR) are voracious predators of plankton and are solitary or form long strings (colonies) that drift and swim by hydraulic pumping of seawater. 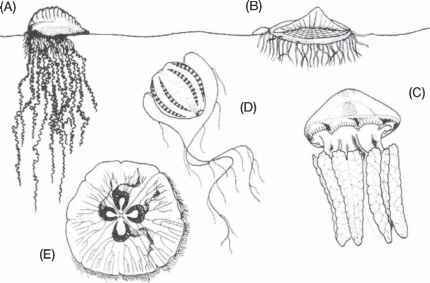 Other gelatinous zooplankters that sometimes form strings, but are unrelated to siphonophores are the salps and doliolids (Phylum Chordata, Class Thaliacea; nine species on GBR) (Fig. 14.13). Their abundance is often influenced by temperature and biologists have focused on this group as an indicator of variation in planktonic assemblages due to climate change. Individuals are often only a centimetre or so long, but they generally form strings and some colonies form cylinders that can be a few metres in length (e.g. Pyrosoma). the water surface feeding on surface-associated prey; mites are also occasionally found in the ocean, although common in sediments.